If you’re looking to sell a quality used Woodwind & Brass instrument we may be able to help. We offer a commission sale scheme where we can advertise and promote your instrument to the thousands of people on our customer database. You can also reach the many visitors to our store and website. Firstly we need to know a little bit more about the instrument, primarily the make & model. We can have an initial consultation about this via phone, email or by using the contact form below. Then to confirm the pricing aspects we would need to see the instrument to give an accurate view of the selling price. We can then also discuss any pre-sale workshop time that needs accounting for. When the selling price is agreed we would then list and promote your instrument on our website, instrument specific newsletters, in-store and on third party selling sites. This ensures a wide range of people see your instrument for sale and this should mean it sells promptly. Which Instruments Do You Sell? We sell a wide range of used instruments for customers, of course it’s all Woodwind & Brass and it would be intermediate or pro level only. We don’t sell student models on commission. If you are unsure or would like to know more please use the contact form below to get in touch. Why Use Dawkes vs Selling Myself? Selling through us rather than privately should ensure a smoother, hassle free sale. You won’t have to deal with questions about your instrument, people coming to see it/blow it, or worry about fraudulent transactions online. In fact, if you factor in all the fees from online auction/payment handling sites, and the fact we can list it at a better price due to the service we’re adding it will likely cost the same as doing it yourself but will involve a lot less hassle. As mentioned we have a huge database of customers on our system, many of them are looking for quality used instruments. Desirable models can sell very quickly off the back of a newsletter – our record is 8 minutes! Of course some models will take a little longer. Our specialist advisors can guide you on this and also the pricing. Correct pricing can also affect the speed that the instrument is sold at. We operate on a commission % – there is no charge for the images, videos, newsletter promotions or display features. The cost for any workshop time would be pre-agreed and then the commission % would be removed from the value of sale (after workshop time). Please use the contact form below to get in touch with your model information and we can walk you through the specifics and financial examples. Q: My instrument is working fine for me, why does it need to go through your workshop? 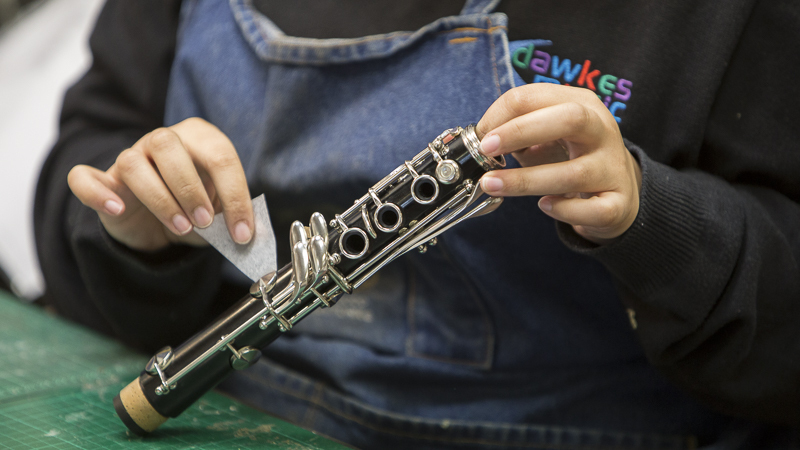 A: We sell thousands of instruments per year, and have done for 50 years. We haven’t seen one instrument in that time that wouldn’t benefit from some time with a technician. There is a big difference between what we call ‘band room condition’ where for example, you pick up a persons instrument and it blows ok vs ‘ready for sale’ condition. When we prepare an instrument for sale it’s our responsibility to make sure it is working to its optimum. On Woodwind this means pads seating 100%, regulation all perfectly aligned, corks and springs refreshed or renewed where necessary. On Brass this means all valves lapped in and performing smoothly, all slides lubricated and aligned, all tubing cleaned thoroughly, any minor dents or marks removed etc. Completing this work before sale is actually in the interest of all parties because: (a) As the seller we ensure we keep our reputation as suppliers of excellent quality instruments (b) the buyer gets an instrument that works perfectly and is not frustrated or disappointed (c) as the owner your instrument will sell far more quickly and easily if it is perfectly set-up as potential buyers will enjoy playing it and thus be more likely to try it, buy it and keep it. Q: How quickly will my instrument sell? A: The old ‘piece of string’ question! Joking aside, this is a really tricky one to answer. As mentioned some instruments sell within minutes of us featuring them in a newsletter but this is the exception, not the rule. It comes down to a few factors: How rare is the instrument? How much demand is there in the market for that type of instrument/model? How has it been priced? What’s the condition like? What time of year is it? What other stock do we have? As you can see there are many factors which can affect the speed of sale. Obviously more highly desirable brands and models will generally sell quicker, some vintage Saxes for example, or Low C Bass Clarinets and Low A Bari Saxes (if all priced correctly), mid range upgrade Clarinets and so on. Whereas some lesser known models, or indeed instruments where there is a saturated market or fewer players out there, will take longer. Whilst our sales advisors can’t look into their crystal ball and promise anything, for obvious reasons, they will be able to give you a rough guide on this before we start. Q: How long does it take from selling to getting my money? A: When we sell any instrument it is on 14 day approval with the buyer. This means they pay for it up front then have 14 days to take it away and make sure they are happy with the purchase. This is a core principle in our customer support as it allows players to really make sure they are happy with an instrument (new or second hand). So, we would inform you that the instrument has sold ‘on approval’ then after the approval period is over (usually 14 days) we would contact you to let you know the outcome. Either the instrument will remain sold and we will then pay you by BACS, or the instrument may be returned in which case we re-list it accordingly.